Saint Galaktion was from Emesa, the son of Cleitophon and Leucippe, pagans who had been instructed in piety by a certain Christian named Onuphrius and received holy Baptism. Saint Episteme, born of unbelieving parents, was baptized before she was wedded to Galaktion. After their marriage they remained in virginity and lived in separate monastic houses. Betrayed as Christians, they suffered martyrdom during the reign of Decius, about the year 250. The Martyrs of Christ, received you in their companies, who through mighty trials contested most resplendently; O renowned Galaktion and thy hallowed spouse and co-sufferer, Episteme, ye both entreat the one God and Lord in behalf of us all. 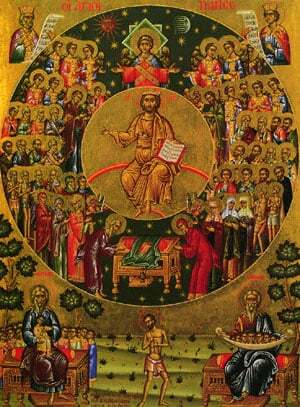 Share the feast of Galaktion & his wife Episteme, the Martyrs of Emesa with an icon greeting ecard.